Background: The context for this discussion is preparation for a consultation on faith and development in South and Central Asia in Dhaka, Bangladesh, on January 10-11, 2011. The consultation is an endeavor of the World Faiths Development Dialogue (WFDD) and the Berkley Center for Religion, Peace, and World Affairs at Georgetown University, with support from the Henry R. Luce Foundation. Its aim is to take stock of the wide range of ongoing work by different organizations that are, in varying ways, inspired by religious faith, but more important, to explore the policy implications that emerge from their interactions with development organizations. The interview was conducted by telephone between Michael Bodakowski and Mr. Abul Kalam Azad. In this interview Azad reflects on his role as the chairman of a faith-inspired development NGO, as well as a public religious figure, using media to reach a broad audience on issues of faith and development. He gives specific focus to partnerships with other development organizations and touches upon development challenges facing Bangladesh, especially those related to politics, gender inequality, education, and terrorism. Can you tell us about your personal background and the path you have taken to arrive to your present position? I come from a very poor part of Bangladesh; the locality where I was raised was a very underdeveloped society. The people there were very uneducated and illiterate. I lost my father when I was 6 years old, and my mother did everything for me from that point forward. She has contributed greatly to my life, and I lost her recently. I faced a lot of hardship in my life. My mother helped with everything, providing me with an education and teaching me many other things. That was the starting point of my life. Coming from a very poor family certainly had an effect on me. Also important is the fact that I had my education in the madrasas. That is where I started my religious education. First I attended the Qaumi madrasa in Bangladesh, and then the Aalia madrasa, which is an integrated system with both Islamic and secular education. In 1970, I started my professional life as a teacher in a madrasa. I had a desire to do something to help the displaced and oppressed members of humanity, and to help people in need, because I empathize with them. I faced suffering in my life, and I was very close to people who were suffering just to make their livelihoods, so I wanted to do something for them as human beings. From that inspiration, I started the organization called the Masjid Council for Community Advancement. For short we call it MACCA. This organization was founded in 1999 and I have been working there ever since. In my view, the media plays a vital role in civil society. Once I had recognized this, I had a desire to also do something with media that would help the common people. So for more than 25 years I have been working on electronic media, such as radio and TV programs. Those are the two areas I have chosen as my personal contribution to help the underserved populations. My organization has worked in social reform. We strongly believe that religion and development should work together to help people. We believe development work is only sustainable through religion; otherwise sustainable development is impossible. I do work with other media and social welfare organizations as well. However, mainly I work through media on issues of social welfare, awareness building, provide people with Islamic solutions to various life-oriented questions, and trying to remove various misconceptions about Islam. Earlier in my life, I could do very little for society, because Bangladesh is such a vast area with such a large population; media has helped me to overcome this barrier and reach all parts of society. Also, at the local level there is a great potential to do development work with village organizations and local religious personalities. Can you speak about the work of the Masjid Council? I have always been involved in a wide range of socio-religious activities, starting from when I was the khatib for the Friday congregation at the Banani Mosque in Dhaka, a very large mosque with a large congregation; I was engaged in leading prayer there for a long time. I found this mosque a useful forum to engage very positive and helpful people in introducing development activities in their communities. And this is applicable to all mosques of the country. The Masjid Council is working in many sectors with a broad range of partners. We are working in the field of HIV awareness building, in which we have engaged local community imams. We have trained imams on HIV/AIDS and have developed a sermon guide that enables the imams to give lessons at Friday congregation and to learn about HIV/AIDS prevention. The sermon guide has 12 sermons to cover a period of 12 months. Presently, we have about 4,000 imams working in this field of HIV/AIDS prevention and education. We also partnered with a development organization called BRAC, a very prominent NGO. We collaborated on a partnership on their WASH (Water, Sanitation, and Hygiene) program. We trained 200 imams as “master trainers” and through those imams, we trained about 19,000 imams in 40 districts in Bangladesh. We have also developed a sermon guide on WASH for disseminating the WASH messages among the general masses through the Imams/Khatibs [Imam: one who leads the prayer in the mosque; Khatib: one who delivers the Friday sermon]. There are at least 500,000 mosques in Bangladesh; in every small village you will find at least one mosque. Through our imam training program, most people attending Friday congregations in the mosques are listening to sermons and learning about HIV/AIDS prevention and care. So, these imams are playing a very important role in the society. We have successfully involved the participation of imams in development projects through partnerships with BRAC, as I mentioned, and also with USAID, through Family Health International. We work with the Asia Foundation as well. We had a partnership with them through a program called LOI, or Leaders of Influence, and we enjoyed a great deal of success in that program as well. In 2009, we worked with UNICEF, on awareness building for bird flu and other infectious diseases. UNICEF was kind enough to support us to raise awareness in our focus communities, and we had 650 imams that participated in the program. We trained them and developed a flu sermon guide for disseminating information to the congregants. We had a program called Development Education for Faith Leaders with the help of COL (Commonwealth of Learning) in 2007-08. This was a distance learning program and we trained 205 faith leaders (both male and female) from all four major religions of the country. We had the opportunity to have religious leaders and development partners in the same room and bridge the gap between them created due to various misunderstandings. The program covered by and large all the Millennium Development Goals (MDGs) and developed necessary modules and sermon guides for all four religions. Another project we have is called the Children Welfare Program (in short, CWP) for abandoned children. We do believe that every human life matters and no human life is redundant on earth. From such an understanding Masjid Council has initiated the CWP initiative to provide food, shelter, education, health care services, and other necessary opportunities to the abandoned children to make them grow as dignified citizens. Abandoned children are recruited from across the country, regardless of religion, color, gender, or physical appearance. At the moment we have 49 children, including 12 disabled, in two separate shelter homes—one for the boys and the other for the girls. How are NGOs seen in Bangladesh, in the field of development? Do secular and faith organizations work well together? Through our programs, working with partners especially, we realized that there are misunderstandings and misconceptions about the role of NGOs in the country. In 2007-2008, we initiated a conversation and gathered the development players and the religious leaders in the same room. It was an exceptional opportunity to have such conversations with both development practitioners and religious leaders. We found that the two communities had similar misconceptions about each other. i. “To learn English is prohibited.” It was said until 1947 when British rule existed in the subcontinent. Most of the Islamic scholars spread this idea to create hatred against the British rule, which originated from a desire of salvation and freedom from the oppression of the then-rulers. ii. One who expects salvation in the hereafter should be far away from worldly development. It was an idea of the so-called Sufis. iii. Women should be confined in their houses and should blindly follow their husbands, be they right or wrong. iv. Paradise lies under the feet of husband. v. To take part in social and political activities is prohibited in religion for women. vi. People having been affected by or infected by HIV are sinners. They should be treated brutally; no mercy should be shown to them. Stigma and discrimination were widely spread out by the religious leaders and so on. vii. Women are not allowed to participate in jobs. i. They are fundamentalists and promoting terrorism. ii. They are of no use for the society, unuseful citizens of the country, etc. and so on. By the grace of Almighty Allah, we had great success in this program as well. We have another associate organization called the Council for Interfaith Harmony, Bangladesh (CIH, BD) that initiates programs to promote interfaith harmony in the country. We reach out to Muslims, Hindus, Buddhists, and Christians to promote values in society. This is a unique organization. Almost all of the religious leaders of the country, whether Buddhists, Christians, or Hindus, are working with us or collaborating with Muslim leaders to bring development and interreligious harmony into the community. These had been creating an uncommunal atmosphere in the society. Today communal conflict in terms of religions has disappeared from Bangladesh. As far as oppression of majority over minority is concerned, Bangladesh is enjoying a remarkable advancement from before. Has the issue of extremism, and the tensions it has created within the development community touched your work on a practical level? As such extremist tendencies did not affect our organization. Rather we played a crucial role when a sign of terrorism surfaced in the country in 2005. Right after the 63-district bombings in August 2005 by extremist group Jamaat-ul-Mujahideen Bangladesh (JMB), we initiated a nationwide anti-terrorism campaign through our organization. We distributed one million posters with messages from the Holy Book Al-Qur’an and the sayings of the Prophet (PBUH). This was such a risky move at the time, and tensions were so high that I had to change my residence, because my life was in jeopardy. However, we worked courageously on this project. We have organized 50,000 sermon speeches around the mosques and collected a statement from Muslim leaders saying that terrorist activities are not in accordance with Islamic principles. We utilized national TV (BTV) to broadcast speeches against terrorism by the prominent faith leaders. Simultaneously I organized and hosted a series of talk shows on BTV and NTV on “Antiterrorism in the Light of Islam” involving the eminent Islamic scholars of the country and thereby reached millions of people within a very short span of time. As a result of these prompt and concerted efforts the situation was successfully tackled by the government and my initiative was highly appreciated. Masjid Council successfully organized a national Ulema Conference titled “Terrorism Extremism and Islam” in the banner of Majlish-ul-Ulema Bangladesh in March 2007, where the leading Islamic scholars of the country attended and unanimously adopted the “Dhaka Declaration” against terrorism. Later on I compiled in a book and translated all the papers presented in the conference. The title of the compiled book is No Terrorism No Extremism in Islam, published in 2008. I have also worked in different capacities in counterterrorism, including attending international conferences in Sri Lanka in 2008, as well as the international imam conference in Australia in 2006. I was invited by the government of Australia to help imams understand better the crisis of terrorism. Overall, I am active in fighting against terrorism and have presented papers and attended seminars on the subject. I have facilitated anti-terrorism training at the National Defense College (NDC) for the military of Bangladesh. I also presented a paper on the importance of interfaith harmony and counter-terrorism in the light of Islam at NDC in Dhaka. Our motto is to bring peace and harmony in Bangladesh. We are focusing on faith leaders from the four major religions and trying to work together. I am serving as a task force member of the Bangladesh Enterprise Institute (BEI) Counterterrorism Team and I presented paper on the “Role of Imams and Teachers in Preventing Terrorism” in 2008 in a BEI program in the presence of a number of foreign diplomats, including some from the British High Commission. Do you face any challenges in your work with imams? There are always challenges in this kind of work. Fortunately, we have been able to use our resources to our advantage, not encountering too many barriers. The imams are much neglected in society. In terms of financial capability and social dignity imams are of less accessed group. Mosques are established and managed by the communities. Imams are giving services from early morning to late night for five time prayers, getting a very negligible amount of money for their livelihood—in an irregular basis in most of the cases. They are being treated as paid servants rather than a respectable religious leader of the society. They have to say things as per the instructions of the vested group, whether these are right or wrong. They can hardly speak the truth for deprived ones because of apprehension of loosing their jobs. I happen to have a good relationship with them, and whenever I reach out to them, they are very accepting of me. The imams in our community are very supportive towards development work. They have a unique opportunity, with access to almost all members of society. They have the access to address the participants, especially in the Friday congregation. They can ask for funds from them for humanitarian issues sometimes and can have significant charity funds from zakat—the obligatory charity for solvent and rich or financially sound ones. Imams can hardly contribute by giving funds from their own pocket because of their financial hardship. We are also trying to introduce the concept of dowry-free marriage. In Bangladesh when you arrange a marriage for a daughter, you need to pay dowry. This practice creates a heavy burden for poor families. At this time, we have held 75 marriages without dowry. And the money required for arranging the marriage program was donated to us by Friday congregation participants. We hold yearly conferences and bring together religious leaders from all different communities, including the Hindus, Christians, and Buddhists, who are all very cooperative. Sometimes there are political and other problems when you work with interfaith communities, but in work for interfaith harmony, there is huge possibility for growth and development in Bangladesh. If there are challenges facing the community which are misunderstood by religious leaders, then I think it is difficult to bring about long-term sustainable change. Are there challenges working as a faith-inspired development organization in Bangladesh? I think the challenges mostly appear in the form of lack of capacity, lack of skills, and lack of professionalism with people working in the field. We need more training and workshops and seminars, and we need to launch more advocacy campaigns to strengthen civil society organizations. Within the political sphere, there is unfortunately some conflict that makes it difficult for politicians to stay focused on development issues. In Bangladesh, however, communal harmony is very strong, and we can easily find people willing to work together and cooperate to build a strong civil society. Can you speak more about the media work you do and other organizations you belong to? I have mainly worked in the faith group, Masjid Council, but I have some other major activities with TV programming on a very popular channel called NTV. I have also worked with another private TV channel in Bangladesh called ATN. I started a program called “Questions and Answer” and it was very popular. I also started a program on the interpretation of the Qur’an, because there were so many misconceptions and misunderstandings about the philosophy of Islam. I am also a part of the OIC (Organization of Islamic Conference). I am a representative to Fiqh Academy in Jeddah of OIC. I have been nominated by the Bangladesh government as the country representative to the Academy for the last six years. The Fiqh Academy usually holds yearly conference in a Muslim country to find out solutions to different sharia issues. I am a member of the National Shariah Council and a member of the national committee, Bangladesh National Social Welfare Council. I am involved with a radio program and with the sharia board for Islamic banking and insurance companies. I am involved with various sharia advisory boards for various Islamic banking and insurance systems, and I have served on the councils for a number of Islamic insurance companies. 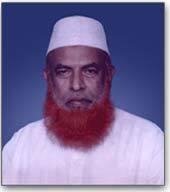 I am also a member of the Board of Trustees of the Bangladesh Islamic University in Dhaka. There is an Islamic monthly magazine called the Monthly Jggasha on which I serve as editor, and I have already mentioned my involvement with the Dowry Foundation and with the counter-terrorism committee in Bangladesh. I believe that I spend my life dedicated to the pursuit of these welfare and development initiatives for the service of my community and my country. What networks do you belong to or do you know of and how are these helpful? We have a partnership with Asia Foundation and Family Health International (FHI) and with water supply organizations. The World Bank supports 60 percent of a water project, and the community has donated 20 percent to bring clean water supply to rural areas. The World Bank supports us through the Social Development Foundation, (SDF, established by the government of Bangladesh under the Ministry of Finance), in the water pilot active in five countries, including Bangladesh, Pakistan, and Sri Lanka. We partner with the Leaders of Influence (LOI) program, which is an effective program; and we are fortunate to be associated with USAID (through the Asia Foundation), on HIV/AIDS (through Family Health International), and with BRAC and Muslim Aid. We also work with the Bangladeshi government and the Ministry of Religious Affairs to coordinate development projects. I have also worked in South Africa in 2007 on HIV/AIDS in coordination with Islamic Relief, where I was invited with other religious leaders. Turning more generally to the issue of development, what are the main sources of conflict in Bangladeshi society? How have faith actors responded? We mainly suffer from lack of political stability. There are two major parties and they engage in conflict with each other, negatively influencing the rest of the society and taking attention away from important issues. There is a lack of education in Bangladesh which leads to frustration and disharmony in society, and contributes to a fair amount of crime. These are the main challenges facing Bangladesh today. If you want to motivate people and work for the good of humanity you have to be able to instill moral values, and I believe that this is lacking in Bangladesh; it is an impediment to long-term sustainable development. We need to address this issue and we need to mobilize religious leaders to help the community. For example, we have the Qaumi madrasa, which are traditional religious schools and focus only on Islamic education without providing any general education. They do not understand or contribute to sustainable development; but I think that if we engage the madrasa leaders, and explain that the Qaumi madrasas are only providing a one-sided education, and that they need to change their education system to be more inclusive, then I think we could encourage them to contribute more fully to the mainstream development of society. We need educational reform, but we also need a platform where we can engage the religious leaders and encourage them to see the importance of development and the need to cooperate. Can you expand on education in Bangladesh? What are the issues, what is the role of faith in education overall, and who are the actors? The system of education was introduced by the British. There were two types of education namely, general, which means secular, and madrasa, or religious education. A person that is educated in the general education system does not have any knowledge of religion and the person educated in the madrasa system is not fully aware of the development challenges facing society. These are both incomplete systems and each lack an accurate or complete view of the issues. Development agencies need to play the role of matchmaker in these two areas. We need to bring changes in the Qaumi madrasa syllabus, which will be difficult, but I do not believe it is impossible. What are the gender challenges facing Bangladesh? There are gender problems in Bangladesh. Even in areas where there is a high literacy rate, there is less awareness; violence against women does occur, especially in rural areas. We do work for gender equity and women’s empowerment and have initiated some programs to address these needs; however, there is more work to be done and we have to engage the faith leaders. The religious leaders have misconceptions about gender equality, but they have started to realize, albeit slowly, that a lot of the traditional rules and regulations regarding women are not appropriate. However, there is still a lot of progress to make in this area: for instance, in elimination of domestic violence against women, including frequent divorce, tortured to death for dowry, acid burning for denial of proposal, etc. What kinds of issues would you like to see addressed during the consultation? What are the most important gaps in knowledge? I would like to see us focus on issues of advocacy and campaigning. We should discuss the importance of training imams and religious leaders and campaigning in general, and the importance of partnerships with other religiously inspired organizations. We need to initiate campaigns and programs to promote interfaith cooperation to address religious extremism in Bangladesh and in other parts of the world.